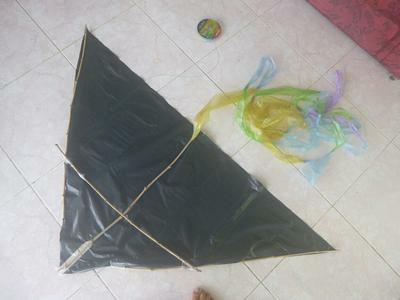 Here in Cambodia its a bit difficult getting basic kite supplies. I found a garbage bag just big enough for the simple delta. There's no dowel but clumps of bamboo with thin new shoots are growing around the place but trying to find some that is straight is a problem. The MBK Simple Delta really is simple to build, it took no time but when I stood back to look at it I thought this will never fly straight. All the bamboo so bent. After many days of waiting for a breath of wind, finally this afternoon there was movement in the leaves. Once out on the field it was a bit gusty about 5 to 10 so give it a try. Up it went straight out of my hand and flew dead straight. I couldn't believe it. 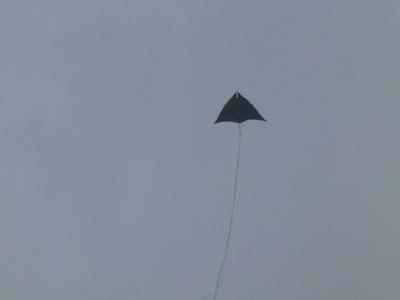 Within a few minutes it was up about 60m and between 60 and 80 deg. Wandering backwards and forwards enough to be interesting but quite stable up there. It was certainly gusty up there though. I could hear the trailing edge buzzing at times. After about 10 minutes it starting looping its way to the ground. A quick look to find the junction of the cross spar and one of the edge spars had slipped inward and the sail come unstuck so letting the air out on one side. Some re-taping and 15min later I was back in the air. This time the wind had dropped a bit but was also less gusty. Maybe it won't go up? But it did. Straight up again and sitting between 70 and 80 deg this time. It was happy up there, hardly any pull on the line. 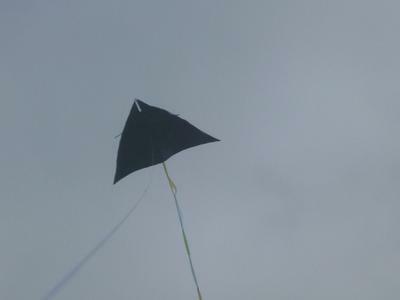 It went past vertical a couple of times and just slowly wafted down a few metres but staying straight until the wind got under it again. Beautiful. Then a few gusts up there and it started to sit of to one side. Looking closely I could see the cross spar pointing further out on on side so it had slipped again. I'll now tie it with some line at those 2 points which should stop that. The bamboo is smooth and tape probably not the best quality and being wet season its over 30°c and humid so tape is going to struggle under those conditions. I looked around and there was a guy with a snake about 5' long and as thick as your wrist. He had it by the tail, swinging it and whacking its head on the ground until dead. Then he put it in the basket of his bicycle and pedaled off home. I know whats on for dinner tonight at his house. I'm glad he found it, not it finding me!